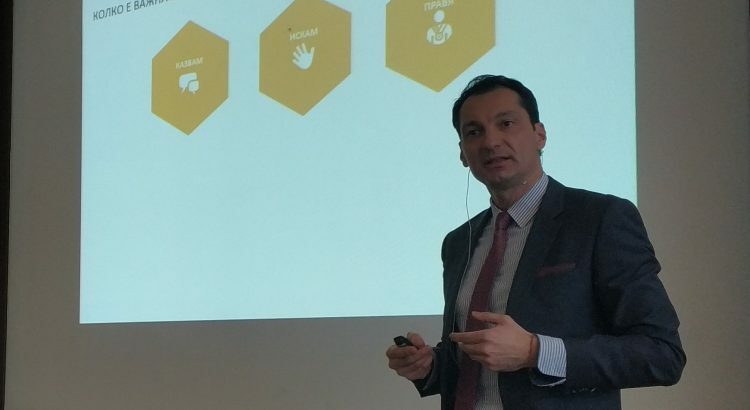 Hristo Borissov, CEO of ARS Bulgaria spoke about the employees benefits at the “For the Business in Plovdiv: A Forum for Integrated Solutions and Practices” forum. It took place on Feb 20th at Hotel Imperial Plovdiv. It was aimed at people from leadership positions working at companies based in Plovdiv and the neighboring region, with a main focus being the introduction of some fresh ideas on how to further develop and improve their business practices. The beginning of the presentation introduced the impact of employee engagement on various aspects of the business. As far as HR department is concerned, employee engagement results in an increase in employee retention and a decrease in employee absence from work. Engagement increases productivity and the feeling of security at work. Employee engagement guarantees a higher customer satisfaction rate, positive customer references about the business and consequently an increased customer retention rate. From financial standpoint, employee engagement can significantly boost sales, business revenues and return on capital investment! 81% of companies admit that email and information flyers are the only communication channels utilized to communicate employee benefits. 58% of employers believe that clearly communicating employee benefits is one of their major challenges. Only 25% of companies have an established communication plan regarding their benefits. Merely some 4% from HR budget is allocated towards the communication of the provided benefits. 42% of companies still believe that they should be investing more in this type of communication. Hristo Borissov pointed out the main factors affecting the engagement of employees, as well as why Bulgaria is falling behind on its level of competitiveness relative to regional and global market players, together with some other very useful information for the guests of the forum “For the Business in Plovdiv”.